Where found: Arctic and sub-arctic oceans around North America, Russia and Greenland. Description: Adapted to life in the Arctic, it has a number of anatomical and physiological characteristics that differentiate it from other cetaceans. The unmistakable all-white colour, absence of a dorsal fin, and the distinctive protuberance at the front of its head which houses an echolocation organ called the melon. The beluga’s body size is between that of a dolphin’s and a true whale’s, with males growing up to 5.5 m (18 ft) long and weighing up to 1,600 kg (3,500 lb). This whale has a stocky body; it has the greatest percentage of blubber. Its sense of hearing is highly developed and it possesses echolocation, which allows it to move about and find blowholes under sheet ice. Belugas form groups of up to 10 animals on average, although during the summer months, they can gather in the hundreds or even thousands in estuaries and shallow coastal areas. They are slow swimmers, but they can dive down to 700 m (2,300 ft) below the surface. They are opportunistic feeders and their diets vary according to their locations and the season. They mainly eat fish, crustaceans and other deep-sea invertebrates. Worldwide population is thought be around 150,000 individuals. They are migratory and the majority of groups spend the winter around the arctic ice cap; but when the sea ice melts in summer, they move to warmer river estuaries and coastal areas. Belugas are one of the cetaceans most commonly kept in captivity in aquaria and wildlife parks in North America, Europe and Asia where they are popular with the public due to their colour and expressivity. Where found: The sperm whale can be found anywhere in the open ocean. Description: Largest of the toothed whales and largest toothed predator in the world. The Sperm Whale breaks all kinds of records! Mature males may reach 20.5 metres (67 ft) and 57,000 kilograms (males much larger than females). It is the loudest of any animal, second deepest diving mammal with dives of up to 90 minutes, largest brain (five times heavier than a human brain), 116 kg (255 lbs) heart, longest intestinal system (exceeding 300 m in larger specimens) and other mind blowing measurements. The sperm whale's distinctive shape comes from its very large, block-shaped head, which can be one-quarter to one-third of the animal's length. The S-shaped blowhole is located very close to the front of the head and shifted to the whale's left, giving a distinctive bushy, forward-angled spray. Primary food is squid and they can live for more than 60 years. The sperm whale's flukes are triangular and very thick. Proportionally, they are larger than that of any other cetacean, and are very flexible. The whale lifts its flukes high out of the water as it begins a feeding dive. It has a series of ridges on the back's caudal third instead of a dorsal fin. The largest ridge was called the 'hump', and can be mistaken for a dorsal fin because of its shape and size. In contrast to the smooth skin of most large whales, its back skin is usually wrinkly and has been likened to a prune by whale-watching enthusiasts. Where found: Dwarf and Pygmy sperm whales are found throughout the tropical and temperate waters of the Atlantic, Pacific and Indian Oceans. However, they are rarely sighted at sea, so most data come from stranded and captured animals - making a precise range and migration map difficult. The dwarf is more coastal than the pygmy. There is no accurate estimate of number of these whales in the world or good data on conservation status. Description: The dwarf sperm whale is the smallest species commonly known as a whale. It grows up to 2.7 m (8.9 ft) in length and 250 kilograms (550 lb) in weight. The species makes slow, deliberate movements with little splash or blow and usually lies motionless when at the sea's surface. Consequently it is usually observed only in very calm seas. These two species were not distinguished from each other until 1966 and are difficult to tell apart but the dwarf is slightly smaller and has a larger dorsal fin than the pygmy. The body is mainly bluish gray with a lighter underside with slightly yellow vein-like streaks possibly visible. There is a white false gill behind each eye. The flippers are very short and broad. The top of the snout overhangs the lower jaw, which is small. The whales have long, curved and sharp teeth (0–6 in the upper jaw, between 14 and 26 in the lower). These whales expel a dark reddish substance when frightened or attacked—possibly to put off any predators. They are usually solitary or paired but have occasionally been seen in small groups. Where found: Arnoux’s beaked whale Berardius arnuxii lives in cold Southern Hemisphere waters and Baird’s beaked whale Berardius bairdii is found the cold temperate waters of the North Pacific. Description: You would not be able to see the differences between Arnoux and Baird’s beaked whales except that they live on opposite ends of the world. They grow to 10–12 m in length and up to 14,000 kg (31,000 lb). They have very long prominent beak, even by beaked whale standards. The lower jaw is longer than the upper and the front teeth are visible even when the mouth is fully closed. The melon is particularly bulbous. The body shape is slender - the girth is only 50% of length. The body is uniformly coloured and a particular individual's colour may be anything from light grey through to black. The flippers are small, rounded and set towards the front of the body. The dorsal fin similarly is small and rounded and set about three-quarters of the way along the back. Adult males and females of both species pick up numerous white linear scars all over the body as they age and may be a rough indicator of age. B. arnuxii is known as Arnoux's beaked whale, southern four-toothed whale, southern beaked whale, New Zealand beaked whale, southern giant bottlenose whale, and southern porpoise whale. B. bairdii is known as Baird's beaked whale, northern giant bottlenose whale, North Pacific bottlenose whale, giant four-toothed whale, northern four-toothed whale, and North Pacific four-toothed whale. Where found: Northern bottlenose whale are found in the North Atlantic Ocean and is found in cool and subarctic deep waters such as the Davis Strait, the Labrador Sea, the Greenland Sea and the Barents Sea and as far south as Cape Verde Islands. Southern bottlenose whales are probably the most abundant whale in Antarctic waters. Description: These sister species are fairly rotund with an extremely bluff melon. The beak is long and white on males but grey on females. The dorsal fin is relatively small at 30–38 centimetres (12–15 in) and set behind the middle of the back. It is falcate (sickle-shaped) and usually pointed. The Northern species measures 9.8 metres (32 ft) in length when physically mature. The back is mid-to-dark grey, with a lighter underside. The Southern bottlenose whale smaller growing to 7.5 m (25 ft) in length when physically mature. The back is light-to-mid grey, also with a lighter underside. Males are about 25% larger than females. These bottlenose whales live up to 37 years. Weight estimates are hard to come by. For the northern bottlenose whale, 5,800–7,500 kilograms (12,800–16,500 lb) is given somewhat consistently, while the smaller and less studied southern species will be lighter. Where found: Open ocean worldwide except in the Arctic and Southern oceans. Description: The Cuvier's beaked whale or goose-beaked whale is the most widely distributed of all the beaked whales. Individuals commonly have white scars and patches caused by cookiecutter sharks. It prefers depth greater than 1,000 m (3,300 ft) and avoids ships, it is still one of the most frequently spotted beaked whales. The maximum known depth reached by the Cuvier's beaked whale is 2,992 metres (9,816 ft), or 1.8 miles, making it the deepest-diving mammal. The species name comes from Greek xiphos, "sword", and Latin cavus, "hollow" and rostrum, "beak", referring to the indentation on the head in front of the blowhole. The body of Cuvier's beaked whale is robust and cigar-shaped, similar to those of other beaked whales and can be difficult to distinguish from many of the mesoplodont whales at sea. Males and females are the same size up to about 5–7 m (16–23 ft) in length 2,500 kg (5,500 lb). The dorsal fin is curved, small and located two-thirds of the body length behind the head. Flippers are equally small and narrow and can be tucked into pockets in the body wall, presumably to prevent drag while swimming. Like other beaked whales, its flukes are large and lack the medial notch found in all other cetaceans. The head is short with a small, poorly defined rostrum and a gently sloping melon. A pair of throat grooves allow the whale to expand this region when sucking in its prey. Cuvier's beaked whale has a short beak in comparison with other species in its family, with a slightly bulbous melon. The melon is white or creamy in color and a white strip runs back to the dorsal fin about two-thirds of the way along the back. The rest of the body color varies by individual: some are dark grey; others a reddish-brown. 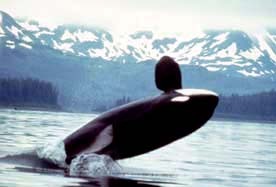 The dorsal fin varies in shape from triangular to highly falcate, whilst the fluke is about one-quarter the body length. They live for forty years. Where found: Blue whales were abundant in nearly all the oceans on Earth until the beginning of the twentieth century. For over a century, they were hunted almost to extinction by whalers until protected by the international community in 1966. A 2002 report estimated there were 5,000 to 12,000 blue whales worldwide located in at least five groups. Before whaling, the largest population was in the Antarctic, numbering approximately 239,000 (range 202,000 to 311,000). There remain only much smaller (around 2,000) concentrations in each of the eastern North Pacific, Antarctic, and Indian Ocean groups. There are two more groups in the North Atlantic, and at least two in the Southern Hemisphere. Description: At 30 metres (98 ft) in length and 170 tonnes (190 short tons) or more in weight, the Blue Whale is the largest known animal ever to have existed. Long and slender, the blue whale's body can be various shades of bluish-grey dorsally and somewhat lighter underneath. There are at least three distinct subspecies: B. m. musculus of the North Atlantic and North Pacific, B. m. intermedia of the Southern Ocean and B. m. brevicauda (also known as the pygmy blue whale) found in the Indian Ocean and South Pacific Ocean. B. m. indica, found in the Indian Ocean, may be another subspecies. As with other baleen whales, its diet consists almost exclusively of small crustaceans known as krill. Description: The Pygmy right whale is rarely seen and little studied. Only about 25 "at sea" sightings have been recorded. It is not a right whale (misnamed) and was thought extinct until 2012. The smallest of the baleen whales, ranging between 6 metres (20 ft) and 6.5 metres (21 ft) in length and 3,000 and 3,500 kg in mass. Despite its name, the pygmy right whale may have more in common with the gray whale and rorquals than the bowhead and right whales. This is, of course, the story of Jonah located in the Biblical Book of Jonah, . The largest mammal in the sea, and indeed, the largest animal in the history of the world, is the Blue Whale (Balaenoptera musculus). A harem is a group of female seals, which are corralled together by a male for the purpose of mating. The male Northern Fur Seals are possessive of individual females in their harem, often aggressively competing with neighboring males for females. Some males breed with up to 50 females in a single breeding season. Some types of whales also have harems. Seals are hunted for their fur, meat and oil. They are also hunted by fishermen to eliminate competition for fish. Seals sometimes take bites out of fish already caught in a fisherman's net, making the fish unfit for sale. If you are planning to visit a zoo or aquarium, be aware that there are various honors that have requirements which can be met by visiting a zoo or aquarium. Individuals can work on multiple honors in one visit, or parts of your group may work on different honors during the same visit. This Honor and the Cetaceans Honor have considerable overlap. Consider working on them together. This page was last modified on 30 July 2015, at 14:07.